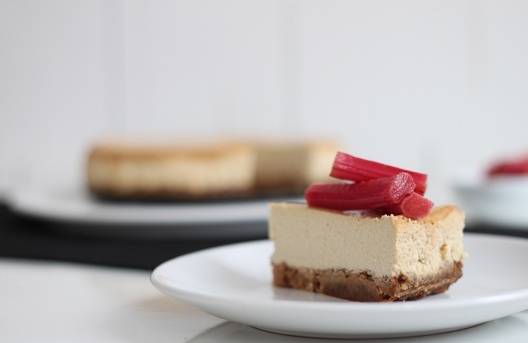 Primal Ginger Cheesecake with Rhubarb Compote Macnifique! 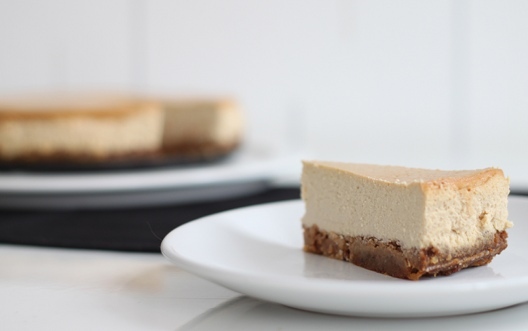 For the last few weeks I have had the craziest craving for cheesecake. Not unusual. I often get cravings for sweet things. As a way to control myself I try to make the foods that I’m craving. That way I appreciate them more, and more importantly, I can control what goes in them – which is pretty important when you’re trying to eat a Primal diet. Some people may argue over the true primal-ness of dairy – and whether it should be a part of our adult diet. I admit that I should cut back a little on my dairy consumption – but I find that I cope just fine with a little dairy in my diet. Do whatever works for you! I would recommend checking the ingredients list of the cream cheese you buy. I found that a brand like Philadelphia contains all kinds of additives, and my supermarket own brand soft cheese simply lists: milk. I like that! Or better yet – make your own cream cheese! But who has time for such things?! Cheesecake is not something I eat often and so I wanted to have something as close to the real deal as possible! Without all those additives, all that gluten and those refined sugars. It was only when the first crops of forced rhubarb hit the shelves that I thought it would be a brilliant idea to make a Rhubarb Cheesecake! AND whats goes brilliantly with rhubarb…. GINGER of course! 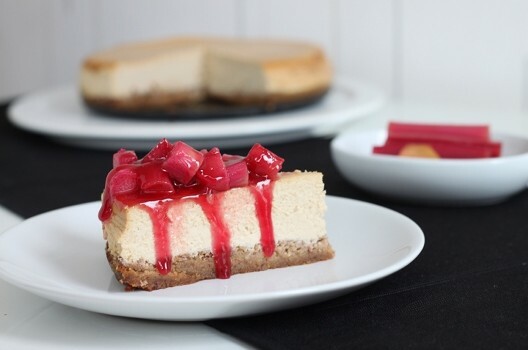 There were so many ways in which I could have gone about putting this cheesecake together but in the end I decided to make a ginger cheesecake and use the rhubarb as a compote to accompany it. My recipe came to be with a little help from Adriana at Living Healthy with Chocolate. Place dish in oven, and roast for 15mins, until the rhubarb is tender but still holds its shape. 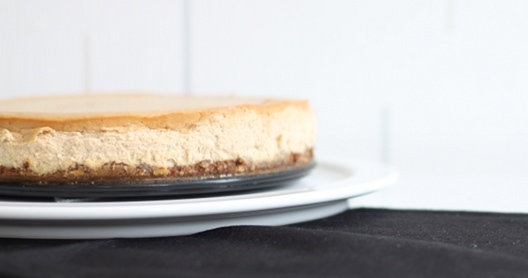 When ready to serve, slice cheesecake (best done when cheesecake has been well chilled, preferably overnight) and top with a couple of spoons of rhubarb compote. I found that the ginger cheesecake on its own was was quite delightful – and that it didn’t really need the compote. Don’t get me wrong, the tart rhubarb compote was a welcome contrast to the creamy and gingery cheesecake – but if you were to skip the rhubarb this dessert will not disappoint! You could even serve this with another complimentary ingredient to ginger… chocolate for example. Ooo or a citrus curd, lemon OR lime would work great along-side the ginger. Or go exotic and pair the cheesecake with perfectly ripe mango slices. Oh, I could go on and on! I found the base to be a little on the soggy side – I guess this could be because it’s made with nuts. Next time I may try using coconut palm sugar instead of honey and maybe coconut oil instead of butter to see if that makes a difference. In a further attempt to rid the cheesecake base of moisture – I will attempt next time to drain the cream cheese and yoghurt of as much moisture as possible by straining it though some cheesecloth. Wow, this looks amazing! 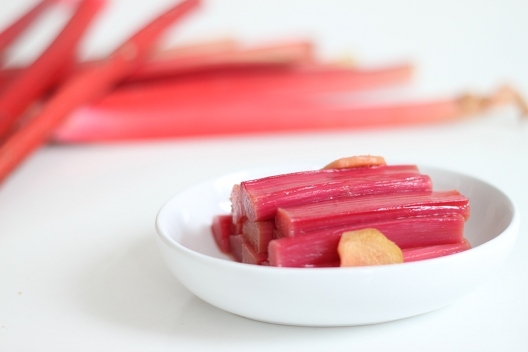 Love rhubarb, love ginger – looks beautifully put together. WANT! Sounds great but I think I’d try it with vanilla instead of ginger, otherwise, looks delish.